Yes, it was. However, they did not broadcast the complete work (or perhaps the entire work wasn't performed at that time?). I don't remember the details now, but there was some discussion on UC at the time of the broadcast and it was determined that only the last three movements were broadcast. Actually, I just listened to my download of that broadcast a few days ago and enjoyed it. First, I also like Steinberg's Symphony No. 4 very much, highly enjoyable music. It's a work full of elan, vigour and memorable tunes, pure delight. I knew it as a broadcast recording for quite some years and was therefore very happy about this (still rather new) Dutton disc. Now, as for the problems with the broadcast recording Maris speaks of, here is the story: this symphony was broadcasted by the BBC in the mid-1990s. A friend of mine (his name is Terry – some of the members here know him) listened to it and already found the first few minutes so exciting that he decided to record the symphony. However, as a consequence, in his recording – which is the one circulating online in various sources – the very beginning of the symphony is missing. Basically it's the slow introduction of the first movement which he didn't record. Anyway, this symphony lead him into collecting Soviet symphonies, and he now has one of the largest collections of Melodiya LPs I am aware of. Our new co-administrator dhibbard knows of a source that has a recording of Steinberg's 5th symphony. Also, David, did you ever hear anything further about Ilyinsky's "Noure et Anitra" Suite which you referenced a few comments just above here? 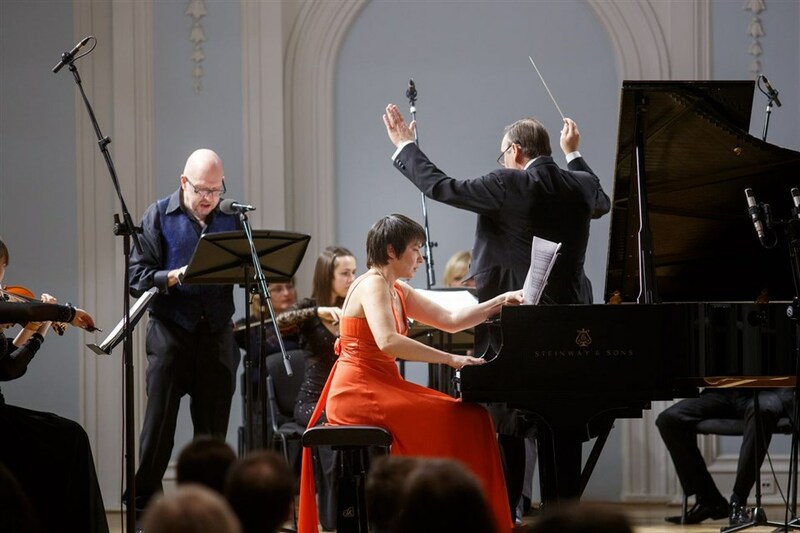 Could you ask your business associate there if he could go to the offices of the St. Petersburg Philharmonia Orchestra once again and have a look? Would you be willing to share details of this associate with me (here or via PM)? I and my colleagues go there regularly and would be happy to check. Now that you are a co-administrator you will probably be getting quite detailed requests for information about the various recordings you have seen! Fascinating - he must have some very rare recordings of little known Russian/other composers! Might he be encouraged to share on here?! Holger, yes I used to correspond with Terry (think he was a professor of Music somewhere in the UK) and he had a huge collection of not only Melodiya LPs but radio broadcasts of Russian and Soviet composers that I've yet to see any commercial recordings available. He had sent me a listing of recent acquisitions back in 2000 that had me spinning in my chair. They were all radio broadcasts...I never heard from him after about 2005... I'll see if I can reach out to him. Christopher... feel free to stop by the offices of the Phlharmonia in St. Petersburg. Unfortunately, I can't enter Russia now due to my work and the current state dept. Oh no what happened? I hope you are ok. I remember the Steinberg 4th broadcast because I listened to it and taped it! It must have been in 1994 because at the time I was writing a dissertation on Russian music of that period. It was just before I went to Russia and spent several weeks in archives and libraries. It was part of a series which included A. Krein no.1 (Adrian (?) Leaper cond. ), Popov Chamber Symphony and Lyatoshynsky no.1 As a result of this, the Krein was subsequently recorded by Brabbins and the Philarmonia and released by Largo, while Lyatoshynsky is well recorded. Thanks Neil, yes a bit on and off over the years. The Largo CD has the Symphony, plus the big Piano Sonata (also written early 20s) dedicated to Heinrich Neuhaus, plus some songs and chamber stuff. An ASV CD -- Songs of the Ghetto -- also has solo pf pieces, songs (some in Yiddish) sung by Lore Lixenberg, and quite a lot of chamber pieces including a quartet. 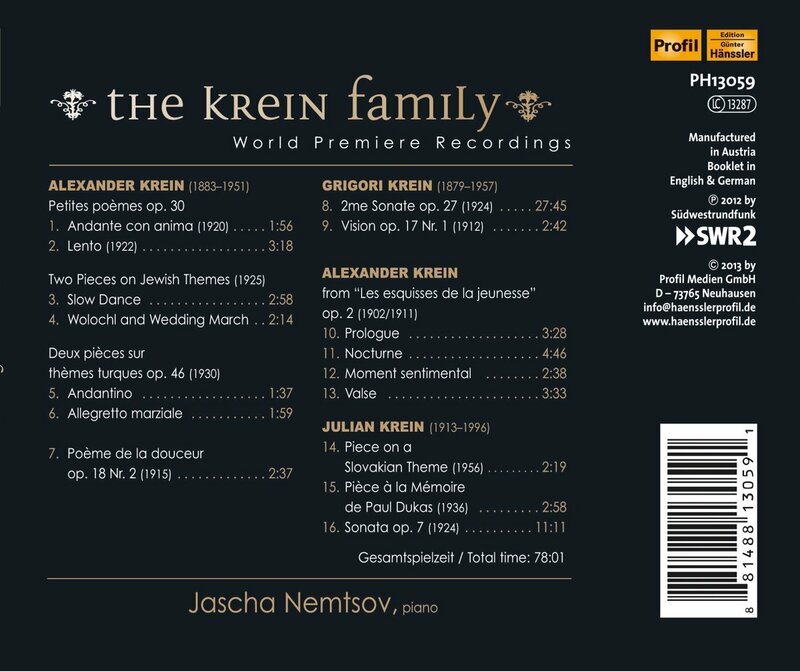 I think I'll do a Grigory Krein solo pf disc later this year. Will let you know. So nothing much orchestral, but within one's limits, as it were. I emailed Terry and the message came back "invalid email address"